Timber Rattler Saddlebag Skinner Knife | BUDK.com - Knives & Swords At The Lowest Prices! This is a fantastic knife for the price. It is full tang and good steel. Seems like I have to sharpen it often, but it's worth it. This has turned into my every day care knife. The knife looks great and works well for everything on a daily basis. I have several more stored in my safe just in case BudK closes them out.This is definitely recommended as a "buy". You can't go wrong. I bought this because as much as I love my big Bowies when I wear them people look at me like thay think I want to murder them, I can carry this little Bowie aroud all day, cut what needs cuting, and although this knife still gets looks its more of a hay thats a really nice knife, then the that thing makes me uneasy look. This knife is gorgeous! The pictures do not do it justice. I do have nice big knives, but nothing this nice. Didn't come super sharp but a little session on the stone and now it is. I've had this knife for a few days now and received a lot of compliments about it. Buy this knife. Now! 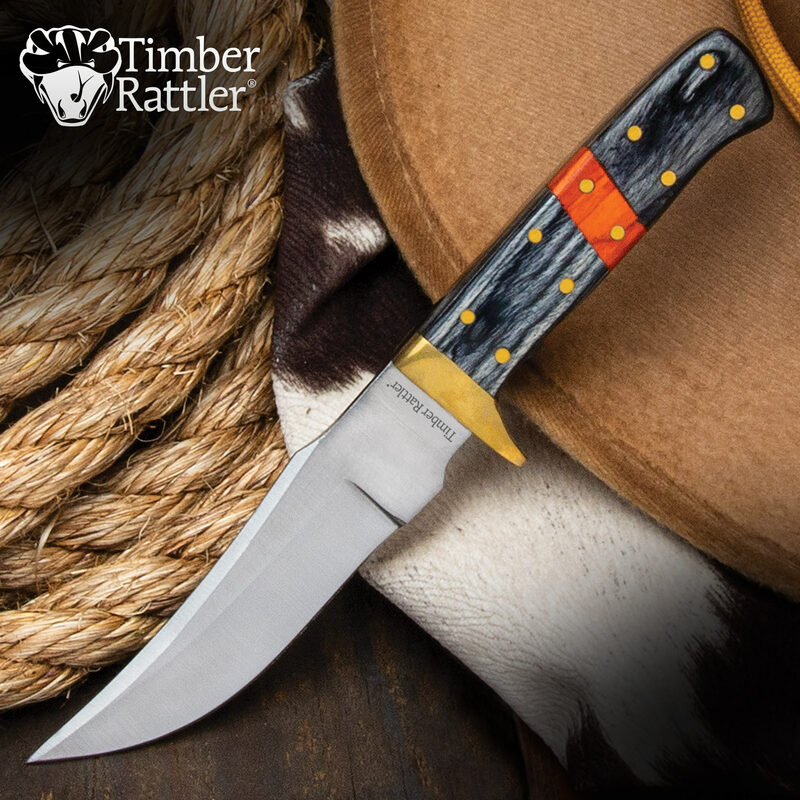 The Timber Rattler Saddlebag knife is a very nice looking knife. Came sharp out of the box and is a very useful knife! This knife has very good craftmanship and is full tang! Has a very good price tag for a knife of this caliber! Worth the money for a tough knife. Will buy more knives from BudK. Thanks BudK!! Very excelent knife out of the box! A very beautiful ans useful knife! Well worth the money! This is one of the best knives I have bought in awhile. Looks nice in or out of the sheath! I have my eyes on a couple of other knives! Good purchase and money well spent!! Can't go wrong with this full tang skinner! Well made and arrived razor sharp. This and the Rivers Edge Saddle knife are my weekend belt knives. Will order more Rattlers. Well made knife. Add thumb jimping and a lanyard hole and it would be a GREAT knife.